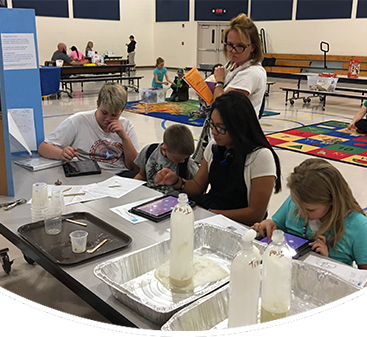 Morristown Elementary School firmly believes in supporting all students with individualized learning and encouraging them to participate in activities beyond the normal school day. Doing so allows children to take ownership of their learning and interact with their learning community outside of the regular classroom environment. We offer a wide range of special programs that both support and encourage our students. Open each tab to learn more about the extraordinary programs we offer here. Students in fifth through eighth grades are eligible to participate in the extracurricular athletics program. We currently offer volleyball, basketball, track, and fitness training. Morristown School is a founding member of the Central Mountain League, an organization that gives our students an opportunity to play games with other schools of comparable size. Other schools in the Central Mountain League include Congress Elementary, Model Creek, Wickenburg Christian Academy, Canon, and Festival Foothills. We require written parental consent for students to participate in interscholastic sports. Students must furnish proof of insurance coverage before they begin participation in the sports activity and must enroll in the after-school program with paid fees or fee waiver. Students will maintain at least a "C" average and will be ineligible with two "D" marks on their progress report or report card. If students become ineligible on the basis of unsatisfactory grades, they may attend after school remedial sessions 2–4 times per week. Students may resume sports when they improve grades to eligibility level. We will advise students and parents of ineligibility by written notice. Injured students must have a physician’s release before returning to playing status. We expect students participating in sports to display excellent citizenship in the classroom as well as on the playing field. Failure to do so will result in loss of sports privileges. Morristown School is fortunate to have a dedicated area for the study and preservation of the Sonoran Desert habitat for students in preschool through eighth grade. Teachers use this site, located just north of the fenced playground, for science, art, language arts, and physical education activities throughout the school year. During the school day, students may only utilize the site under teacher supervision after initial parent permission. There is limited shade on the trail, so we encourage students to wear hats and closed-toed shoes. The Sonoran Trail is open to the public and is equipped with benches, trash cans, informative signs, and two water fountains. Developed with the funds from the environmental license plate fund and the work of many volunteers, we hope that students who use the trail will see themselves as stewards of the environment. Students and staff always look forward to the yearly face-lift the trail gets each fall from the Grand Hikers Club. It is open for community access when school is not is session. Our ESL program supports English language learners as they master the language in academic and social environments. Our goal is to help these students attain academic excellence through a variety of learning opportunities that will help ensure success for all students. At Morristown Elementary School, “the arts are the heart of education.” Experiences in the arts give our students opportunities to exercise problem solving, critical thinking, creativity, and perseverance. A blank piece of paper, a lump of clay, a musical instrument, or even a written a story or poem, are all problems to solve for our young thinkers. The skills our students develop while creating and producing the finished product are the same skills they will use someday in the workplace and everyday in life. We are proud to showcase our students’ work in the performing arts in December at our winter programs. In April, we display their work in the visual arts at our school-wide art show. This popular event is co-sponsored by the Parent Teacher Student Association, (PTSA). The PTSA provides award ribbons and serves a delicious pancake breakfast during the show as a fundraiser. Over the years, our students have had the privilege of working with professional artists via the Artist in Residence program. This program brings an artist to the school to teach and demonstrate his/her art form over a two or more week period during the school year. Our students gained valuable experiences as they worked with Juanita Hull-Carlson, who creates mosaics from cement and “cool junk.” Teresa Shostakovich taught our students the art of “close drawing” for realistic effect. Susan Bendix integrated dance and technology to create some of our first student-created videos. Students learned about the power of Taiko Drumming with sensei Eileen Morgan. Since 1985, our students have worked with over 30 artists from a variety of genres. Our special education program works with families to create Individualized Education Plans (IEPs) to meet the special needs of their children. This plan includes related services in and out of school, at no cost to the family, to complement the student’s personal instruction and ensure that he/she receives the most benefit from his/her education.